I’m really excited about the new iMac but decided to wait to buy it. The reason why might help some other folks out there make a decision about this new contraption. On October 15 Apple announced a new iMac that has a display with more pixels than anything ever built for consumers (1). It has 5120 pixels horizontally by 2880 pixels vertically. The horizontal pixels make it a “5K” and the resolution for the viewing distance makes it a retina. I considered purchasing it for my photography so I brought it up to my professional photographer’s association in a discussion board. I thought the concerns they brought up were worth sharing. So why would someone hesitate buying this? The first issue some of you may have is that with more pixels comes slower processing. If you have this concern I’d like to share my experience owning a Retina Mac Book Pro (MBPr) since 2012 and compare it to test results. I use my MBPr to run Lightroom and Photoshop almost all day every day for two years and I’ve never experienced lagging or delays. I process full resolution RAW’s through LR and performing complex actions in PS. I even occasionally render involved multi-layers movies in Premiere Pro. The things chugs beautifully. I’ve seen speed tests doing video editing who get speed enhancements while using their MBPr when they dialed back the displays resolution. It’s having to run the original pixels through all your layers and render them. For video I can see how that might slow the whole thing down because the source pixels are changing at a rate of 30 times a second. For still pictures, on the other hand, those source pixels don’t change. That’s why I don’t experience lags. I’d say as long as you upgrade to 16GB photographers will be fine. I remember a computer purchase that was delayed because of the speed of newer and better models coming out. My dad wanted to wait to buy us our first computer. It was 1990 and the 486 had just come out to replace the 386 which had been released 4 years earlier. Hows that timeline now? In 2012 the MBPr machine was just an absolute amazing capability packed in such a small and rugged package it was mind-blowing. Fast forward to now, the end of 2014. It’s no less remarkable since no one yet has made anything that compares when you measure it adjacent to true laptop factors: performance, reliability, and ruggedness. 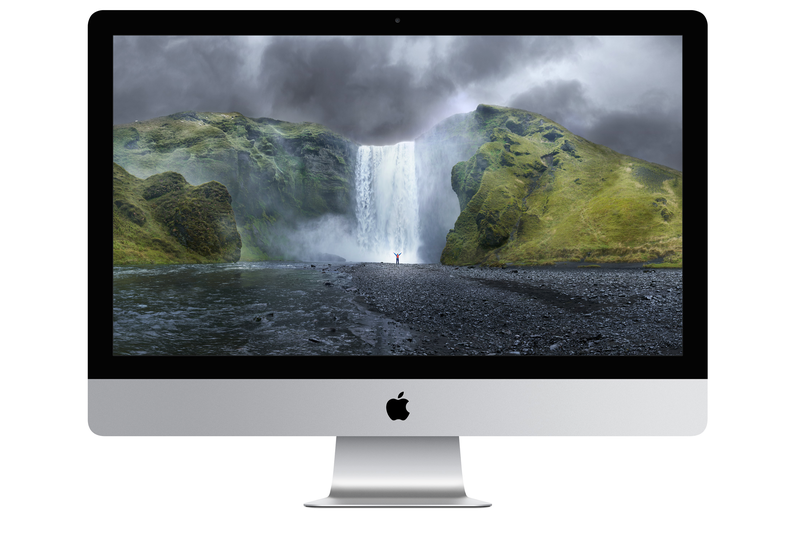 I do think the new Retina 5K iMac is simply the perfect photographers tool. The only reason why I’m not buying it is because my laptop is still so capable. So yes, with a 16GB upgrade I think that machine will simply fly. It will likely be so fast it’ll perform edits before you move the mouse. At the current pass of technology I think it will take three to four years for someone to offer something better to the technology put into this machine. You won’t notice the difference between 4K and 5K, it’s only 25% increase isn’t it? A 4K display has 8.3 Million pixels and the Retina iMac has 14.7 Million. At 77% more pixels it’s something you’ll notice. That’s 77% more pixels to hold toolbars. That’s 77% more likely you won’t have to hit the zoom button while editing because you’re already at 1:1 ratio. So Apple has this thing about 8 bit. If you use the Mac OS you’re stuck with 8 bit in fact. That’s it. If you use a PC you can buy a 10 bit monitor and jump through a couple of other hoops and be able to see 10 bits of color on your monitor. Playing my numbers game it looks huge. 8 bits of color means your display can show 16.7 million colors. (As a frame of reference we can see about 10 million colors.) A 10 bit display can show four times more at just over a billion. Is that useful? So yes, giving LR and PS trillions of colors to edit with has a noticeable effect on the final product. This same effect isn’t transferable to extra colors on the monitor. Those 900 million extra colors are going to an eye with a palette of 10 million colors. So the net result is we end up seeing a smoother transition on our screen between colors. The only way it can affect our final product is if it changes the way we edit. *I have never seen a 10 bit display! From conjecture only though I can’t see how it can change the way I edit and therefore see a low chance for having 10 bit making an impact on the final product. A really smart tech savvy person I trust who has actual experience with a 10 bit display says it does, I just can’t see how. I certainly see this chance weighing far less than the assurance of having 14.7 million pixels that I know I’ll use. 4K monitors average about $2,000. The cheapest is about $1,500. This monitor is $2,499, has 77% more pixels and comes with an Apple computer inside. It’s a good buy if you want the pixels. The 5K monitor is SO much more pixels than the 4K and what I have now, essentially 3K. It’s priced very reasonable for those pixels. The 8 bit vs. 10 bit debate is a minor annoyance. There’s no point waiting for any other company else unless you’re very patient. The issue is my MBPr is still so capable. Apple makes products SOOO resilient to abuse it’s still in perfect working condition. It’s still able to process my photos so well. The display is still so breath-taking. So what do I do since I don’t think anyone else is coming out with a 5K display anytime soon? I’m waiting for Apple. Since my MBPr is still so capable I’m waiting for the 5K Thunderbolt display. Please hurry Apple, my eyes want 14.7 Million pixels. (1) Dell announced a 5K TV September 2014. Release date and price are unknown. ← What are your Flash Triggering Options?